Alpha (Oxford Twp.) High School "Bulldogs"
The residents of Alpha (population 726 today) started a school in 1857. A new building was built in 1884 and was replaced in 1909. This building housed the first Alpha High School, which has its first commencement in 1895 with 12 graduating pupils. 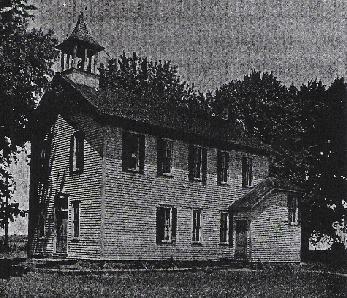 The 1909 building became the grade school in 1924 when a newer, Oxford Township High School, building was built next door specifically for the high school grades. 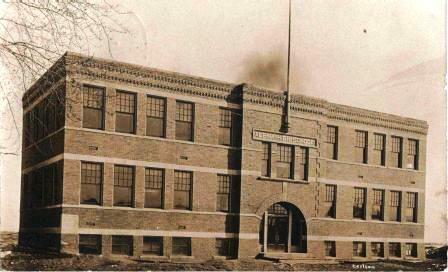 The 1909 building (grade school) was destroyed by a 1941 fire. It was replaced by the brick structure pictured above. Alpha supported their school proudly until consolidation talks with nearby Woodhull became a reality. This took place in 1948 when the school districts of Alpha and Woodhull formed Alwood School District #225. The Alpha High School building from 1924-1948 has since been torn down. 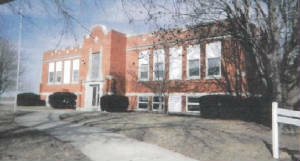 The "new" building now serves as the grade school for the Alwood school district. We know that the Alpha boys competed in basketball and football. It is believed the Alpha High School students also participated in baseball and track. If you have team records or conference champions from other teams, as well as those listed below, that you would like to share please forward the information to us. The official name of the Alpha High School athletic teams was the Bulldogs. However the Alpha teams were sometimes referred to as the "Miners" because of the coal mines which once existed around the area. The Alpha High School Bulldogs boy's basketball team could play with the best of them, a tradition which continues at Alwood HS today. The Alpha roundballers brought home one District title and five Regional titles in their existence. As stated on other pages, IHSA hardware is only one measuring stick for athletic or school successes. Alpha's first basketball facilites were upstairs in a two-story building, according to the town's centennial publication. A gym was built in 1923-24. Several scores involving Alpha High School in the IHSA state tournament were located on a site titled "Illinois Postseason Basketball Scores." These scores are listed below. 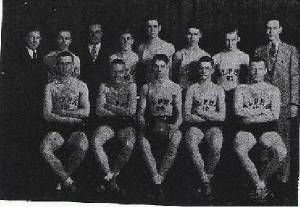 **In addition to its 1927 Henry County championship, they won it in another unknown year between 1924-26. From 1924 to 1929, Alpha won 72 percent of its games! Moline lost in Sweet 16 Rd. Title Game lost to Aledo 34-31 . **Final game for the Alpha High School "Bulldogs." Consolidated with Woodhull in the summer of 1948 to form the Alwood School District. Dean Kelly - Led the Bulldogs to a 16-11 record in 1940-41 and was among the area's leading scorers with 270 points. Football was offered at Alpha beginning in 1939. They won a conference championship in 1943 and was runner-up in 1944.